Codes have a hierarchical structure, meaning you can create multiple subcodes, followed by subcodes of subcodes. All of the codes are shown in the “Code System” window. At the beginning of a project, this window is empty except for the “Code System” and “Sets” icons and their associated icons. A code is a text with a maximum of 63 characters consisting of one or more words. A code can contain empty spaces and special characters. The number of codes in unlimited. The hierarchical structure can contain up to ten levels. Codes can be assigned a color. The so-called color codes play a special role. They are like text markers and change the background color of the marked text. emoticodes also play a specific role. An emoticon symbol appears in the “Code System” in the place of the code symbol, with pre-defined names that can be changed. Beginning with MAXQDA 12, there are also special codes for the participants of a focus group. These codes can be identified by this icon . These codes can perform special functions. Working with coded segments (of text and images) and the “Code System” is a central aspect of computer-supported analysis. This work is usually not done automatically by the software, but rather is controlled by the researcher, although this often requires a significant amount of time. The “Code System” is shown as a tree structure on the screen. It looks like the file/folder system in Windows Explorer or Mac Finder with which you are likely familiar. A plus or minus sign before the code name indicates whether or not a code contains subcodes. You can expand or close the sub-categories by clicking this button. You can click on the triangle symbol before the code to reveal or hide its subcodes. Tip: With the function Collapse all subcodes, which is accessible from the context menu of the top level of the “Code System”, you can conveniently collapse all codes so only the top level codes will be visible. Using MAXMaps you can build a network structure of codes to be used during the coding process, meaning you can code selected segments within a document and code them by dragging them onto a code in the network map. Reset activations – resets current code activations. Display emoticodes only / Display codes and emoticodes – reduces the display in the “Code System” window to emoticodes. Change to table view / Change to standard view – switches between tree view, and table view of the code system. New code – adds new code into the code system. 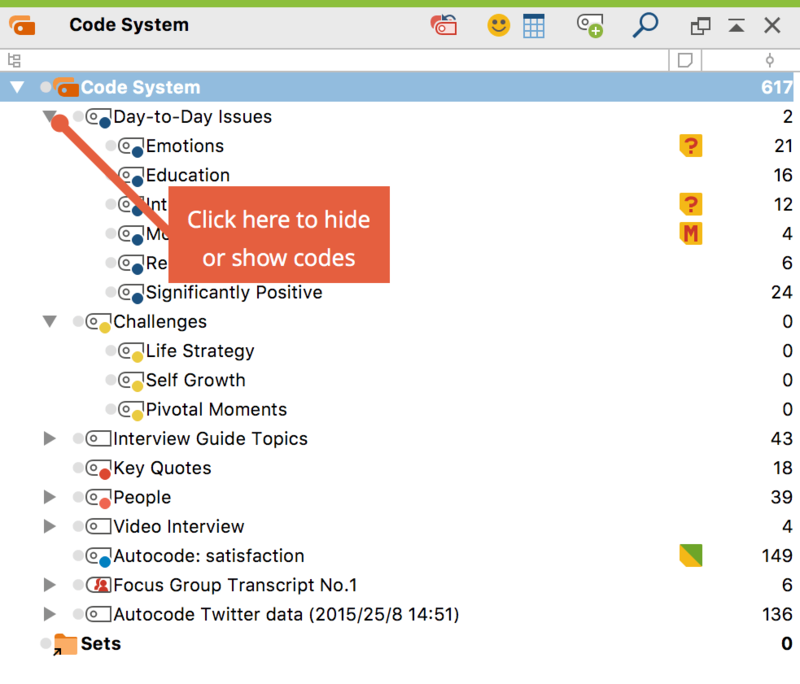 Display search toolbar – allows you to search for a specific code. In addition to using the toolbar to access functions in the “Code System,” you can also use the context menus that appear when you right-click on various icons in the window (e.g. on a code or the “Code System” icon, etc. ).